Crosspoint Community Church has partnered with a local elementary school, Rowan Elementary, to help meet the needs of their students through a program called BACKPACK BUDDIES. The goal of our ministry is to help individuals and families in their time of need. This Program provides food to students that are not able to eat over the weekends while away from school. BACKPACK BUDDIES places nonperishable food items in their backpacks on Fridays that keeps them fed throughout the weekends. While we do want to meet a physical need, our goal is to demonstrate our love for people. We do this by providing for them, while proactively developing a relationship with them so that we can reach deeper and minister to their spiritual needs. We believe that the greatest example of such love was provided to us all in Jesus Christ, who joyfully loved people He encountered by meeting their physical needs on His way to the greatest act of love the world has known, when He provided the opportunity for salvation by dying on the cross for the sins of humanity, and being raised from the dead in victory over sin and death. We want to emulate Jesus in how we love others. Jesus tells us in John 6:48, “I am the bread of life,” and in John 10:10, He states that He came that we “may have life and have it abundantly.” We hope that through this ministry the individuals we come in contact with will experience true love and have a more full life. Items needed for the BACKPACK BUDDIES? Any type of soup or meal in a can with a pop top lid, mac-n-cheese, fruit snacks, individual bags of chips, cookies, crackers, Pop-Tarts, snack-cakes, Jell-O, individual cereal boxes, pudding, juice boxes, small bottles of water, etc. 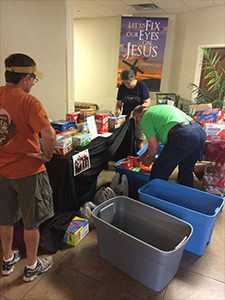 All other non-perishable items will be used to make baskets for families through our BREAD ministry. View the full Grocery List below. 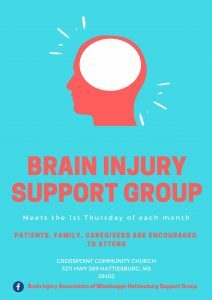 The Brain Injury Association of Mississippi-Hattiesburg Support Group is for patients who have suffered a brain injury as well as their families and caregivers near Hattiesburg and the surrounding areas. They meet the first Thursday of every month at 6 pm in the fellowship hall here at CrossPoint Community Church.